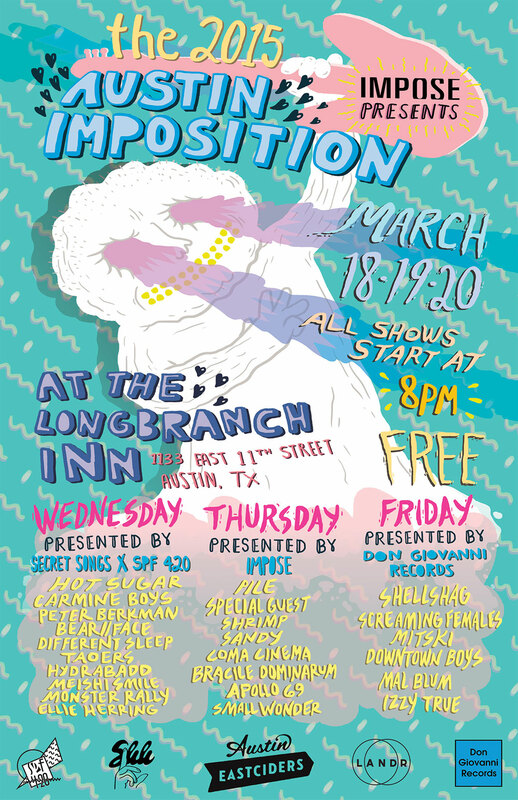 Returning for the whateverth time, we’re back once again for our annual Austin Imposition shows! This year we’ll be holing up at the Longbranch Inn on March 18, 19 and 20 for three shows of epic proportions, thanks to this year’s curators Secret Songs, Don Giovanni and SPF 420. Just how epic? Peep those lineups below. Screaming Females, Hot Sugar, Pile, Downtown Boys, Ellie Herring, Mitski, Carmine Boys, and a bunch more we can only vaguely announce will be repping SPF420, Secret Songs and Don Giovanni. The 2015 Austin Imposition is supported by local hard cider company Austin Eastciders, and Landr, the do-it-yourself mastering platform, who will be recording and mastering sets on Wednesday and Thursday. Pay attention to this page for lineup updates and other details. And as always, there’s no need to bring money or a badge to get into our shows.